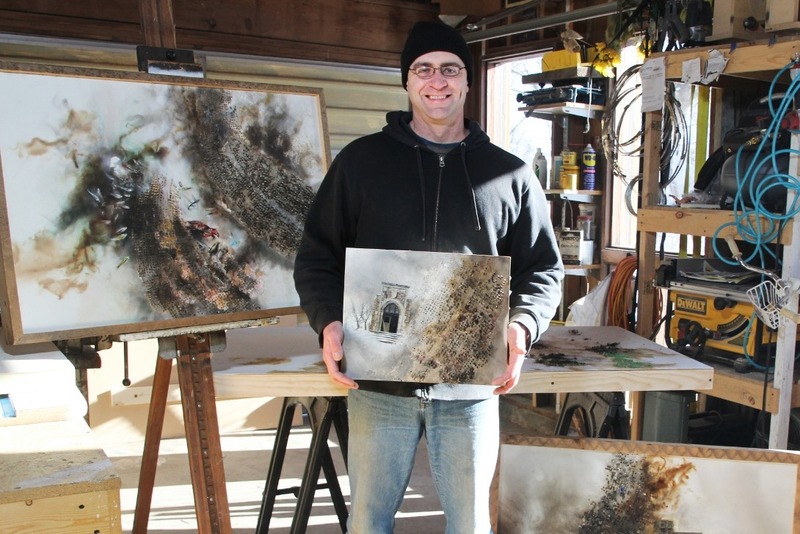 It all started when Al Ross (WI Public Radio) asked artist, Eric Lee to stop by to talk about a marvelous honor he’s received: an invitation to exhibit his artwork at the May, 2019 Venice Biennale. International in scope, monumental in recognition. During their conversation it was revealed that, as in many high-profile events, there’s a participation price – and it’s expensive. But, here’s where things turned poignant and took on must-help: as Eric recalled the process, he related the heartbreaking experience of losing his youngest son, Vinnie, to cancer this past year. Obviously, reason enough for compassion. There’s more. For a period approaching two years, while he cared for his son, Eric couldn’t create new artwork. Then, following his six-year-old’s passing, as a tribute and in his name, Eric decided he would not accept remuneration for any previous work, hanging and for sale in the Pablo Center and elsewhere. Rather, all funds would go to Beacon House, where homeless individuals and families find shelter. Unquestionably, one of the most noble gestures we can recall. There is a mid-March deadline for Eric to submit the $12,000 fee to exhibit in Venice. He will have access to withdraw any or all of the funds any time after March 8. While he doesn't expect to be able to attend this event in Venice, we hope a portion of proceeds might allow for that. We can do this, especially since our visual arts community supports and respects the work of our local creatives . What better reason to support our local artists? We are absolutely blown away by your generous donations! Whether you were able to give $10 or a $1000, we thank you. It reflects your loving support for Eric, his artistic talent and his family. It also makes a huge statement in support of our creative arts community! THANK YOU! Here's to you, Eric. We hope this also provides a chance for you and your wife/family to attend the Venice Biennale! Best wishes!